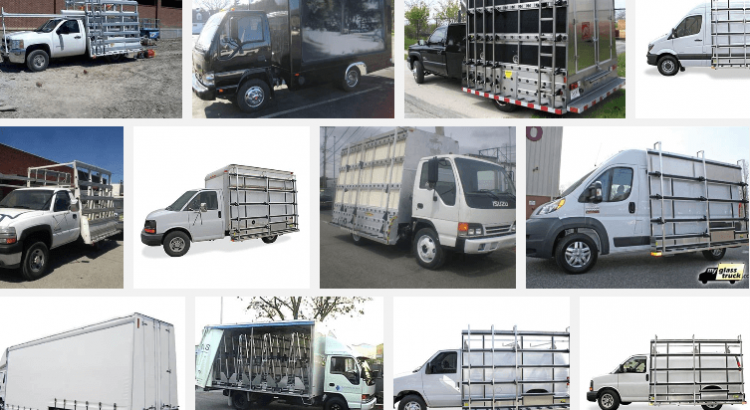 The most common way that glass and window replacement companies transport glass units is with aluminum or steel racks that are specially designed to transport glass. These racks are usually built to carry thousands of pounds and have rubber in all areas that the glass may come in contact with. Racks come in all different arrangements and sizes depending on the type of work most common to a specific glazing contractor. Some companies specialize in shower doors so their racks will be used primarily for thick glass units that can be oversized. Some glass companies work with common residential jobs like small broken windows and patio doors. These companies may use some racks that are built into the bed of a truck for these types of jobs and use their larger trucks for commercial and custom glass installations. A good example is Valleywide Glass in Phoenix, they provide a lot of small service jobs around the valley and transport patio doors, IGU’s and Laminated and Tempered glass for quick replacements. 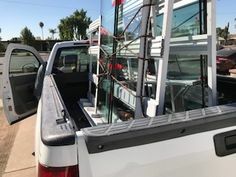 All types of common pickup trucks can be fit with glass and window carrier racks. The only thing that differs is size. 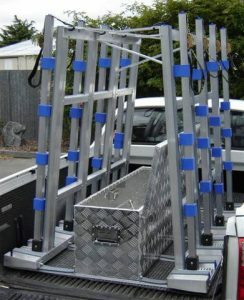 The bigger a truck or van is the bigger the rack that can fit and in turn they will be able to transport more jobsite product than a smaller vehicle. If you do a search on google images for glass racks and vans you will get many ideas on how to set it up. If you are the owner of a glass company, glass manufacturer or window installer then you may want to get racks straight from the top providers. There are a few big companies in the rack industry. Unrush is a revamped website for Unruh Fab who has been making tons of equipment for new racks as well as replacement parts for old ones. 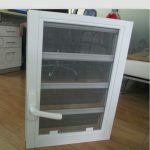 Myglasstruck.com has a wide variety of glass transport racks and trailers available. 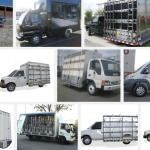 A lot of the companies that make racks also offer different kinds of trailers. A trailer is nice because you don’t have to pay as much insurance and only use it when needed. You can keep a small truck with an internal bed glass rack and then have a special glazing trailer when you need to load up a bunch of replacement IGUs or Patio Doors for a special big job. When it comes to transporting glass make sure you follow the proper safety procedures. Here is a good article that tackles the safety issues of moving heavy glass sheets around safely whether you are in a glass plant environment or a window installation professional. New windows can completely change a room and save a homeowner hundreds of dollars on energy costs. The cost of new windows alone can be a bit staggering, so many homeowners save money by installing their own window replacements. This does not come without its own set of challenges, but an especially handy homeowner may be up for the task. It is important to plan the job, and know that window installation does take a significant amount of time. Allow for ample time so you do not end up working through the night to keep the wind out of your home! Having an extra set of hands to help with the job is advisable. A partner to help with heavy lifting and holding the window into place is an advantage to getting this job done quickly and as painlessly as possible. First begin by measuring the old window. Measure the height from three different parts of the window. Windows expand and contract frequently, causing them to disfigure over time. Take the smallest of these three measurements and record it. Measure the width of the window, again, from three different places, and record the measurement. Investigate how square the existing window is by measuring the window diagonally from the top left frame corner to the bottom right frame corner, and from the top right frame corner to the bottom left frame corner. If the measurement is more than ¼ inch difference, the entire window frame will need to be replaced as well. Being able to reuse the old frame will save money short term, but a full window and frame replacement guarantees a much more efficient and visually appealing window in the end. Carefully remove the window stops and set them aside. The window stops prevent the window from falling out. If they become damaged, they will need to be replaced. Most times, the window stops can be reused. Remove the window and frame. Install a new frame in the exact location of the old window, using the exact same measurements. Seal the frame after installation. If you have have window treatments or blinds that need to be removed be aware that when you remove the blinds or shutters it can chip the paint and caulking around the wooden shutters where it connects to the wall. Position the new window inside of the frame. Do a “dry install” to be sure that the window will fit the space. Once satisfied with the windows positioning, apply a thin bead of silicone along the top edge of the window stop. This is where your partner comes in handy. 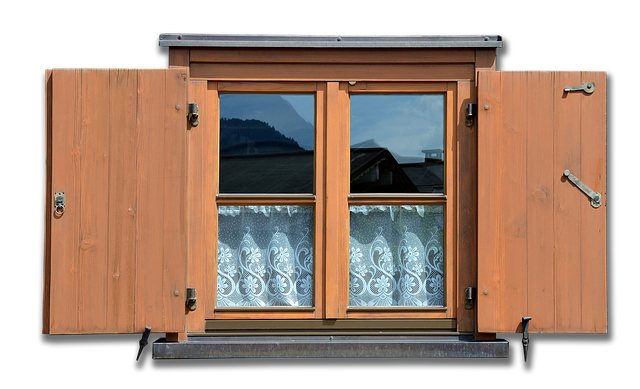 While one person holds the frame, drive wooden shims in below the window until it is level and tight against the top of the frame. Carefully insert shims or nails down either side of the frame to hold the window into place. Finally, measure the window to ensure that it is square and level, make any adjustments necessary to the shims to make it so, and attach the frame by using the screws provided. Normally there are holes in the frame pre-drilled as a guide to where to install the new screws. Secure the window and fill in any gaps between the window and frame with insulation to help prevent air from escaping. Fiberglass insulation is the best in this case, since it blocks early all air from passing through. Though it may appear easy, window replacements require planning and skill. A Glass Company would be a good choice if you have a window or multiple windows that are not easy to install. A homeowner should be sure of their ability before attempting to replace their own windows. A poorly installed window can lead to problems down the road. An efficient window is only as good as its installation. Whether you are moving into a new home or just renovating the home you are currently living in, you should keep in mind that replacing your blinds can be one of the most dramatic changes you can make. Not many people think about replacing their window blinds when it comes time to renovate, and they just keep putting the same old blinds back up. But, if you want a drastic change in the look and feel of any room, changing your window blinds will give you that change. When you start looking for different types of window blinds, you will see that there is a large variety available to you. Most of the common blinds are made from aluminum or fabric, although there are wooden blinds that are great for a more natural look and feel to your room. However, what you really need to decide on is whether you want the traditional blinds that mount above the window, or the magnetic blinds that mount with a magnetic adhesive strip that attaches to the window frame itself. Magnetic blinds take away the need for tools and create a more clean installation than standard blinds. The only real issue with magnetic blinds is the fact that the adhesive deteriorates over time, and this can cause your blinds to suddenly fall from the window. Of course, there are things that you can do to make sure your blinds aren’t suddenly found on the floor. One thing is to check the adhesive from time to time and replace it if needed. You should also keep a constant temperature in your home; dramatic changing of temperature weakens the adhesive and will cause it to fail sooner. Whatever type of blind you decide to go with, make sure you do some research before you purchase them. Some blinds are great for high humidity areas while others are perfect for drier conditions. You should also make sure that your measurements are correct as nothing is worse than having your blinds ready to put up and then find out that your measurements were off. If they are too short, you will have to purchase new blinds, but if they are long, you can center them over the window. Millions of people live in older homes with double hung windows in them that have a tendency to leak during bad weather. Or the tempered glass breaks, or the seal fails. Don’t let this make you go out and spend a fortune to replace your windows, though. Instead, use some tips and tricks to get them weatherized and you won’t have to worry about them for years to come. In fact, by placing a small amount of weather stripping in the window sills, you can keep all that cold air and dust out of your home. It’s simple and very cost effective when compared to the price of new windows and installation. The best weather stripping to get for the sash and the jamb is a V-shaped stripping. This polypropylene stripping has an adhesive strip on one side that you apply to the jamb and presses against the sash sealing it. The first thing you need to do in order to apply this stripping is measure the sash and add two inches before cutting. Once you have it cut, you’ll need to tape the open end of the V with a bit of scotch tape and open the replacement window all the way. Slide the taped end between the sash and the jamb. Then, peel off the paper to adhere it to the jamb. With this being so simple it’s surprising more people aren’t saving money by weatherizing their windows instead of buying new ones. To seal the window where the sash meets the sill, just purchase a piece of compressible foam that has adhesive on one side. Clean the sill to make sure the adhesive sticks well, and install the foam. Now, when you close the window, make sure the window blinds aren’t in the way., it will compress the foam and create an air tight seal. If your windows have been painted shut and you never need to have them open, you can seal them with caulking or removable sealant instead of trying to fix them so they open. This is a great way of keeping the weather out of those rooms you may not use as much. You can do some research online to find other ideas for sealing windows located in basements or attics where the moisture difference is noticeable. Basements should be highly waterproof in order for the seals to work correctly. Attics should be able to hold up to high changes in temperatures. By taking these steps, your home can be insulated from the weather at a reasonable price. You can always call the pros at a company like Milgard and get their advice. 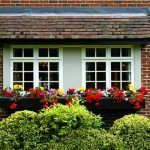 Timber window frames have been the most popular for decades, but the uPVC frames have started to make a great difference in the materials people are using when remodeling their homes. 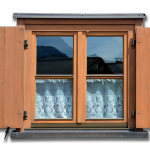 While both camps of window frame manufacturers claim to be the best material out there, there are some differences that people need to be aware of when choosing which material to use. First is the lifespan of each material. While timber has been used for the longest period of time, uPVC states that they’re virtually maintenance free for up to 25 years. Timber, on the other hand, requires painting and maintenance every couple of years to make sure they stay in good shape. But with the newer technology available these days for the treatment of timber before it gets installed into a window frame, you can expect much less maintenance over the years than you used to. This, of course, takes you right into the environmental aspect. Timber requires trees to be cut down and the chemicals they use to treat them aren’t necessarily environmentally friendly. While uPVC doesn’t require trees to be cut, the creation of the materials is from plastic, and that isn’t very friendly to the environment either. Vinyl windows have come a long way, they are used in new windows and glass doors, though, as most of it is from recycled plastics, and this is a good thing for people that want to stay a bit closer to the green side without having to cut down trees. You also won’t have to repaint the fiberglass frames, and this saves the environment from harsh chemicals that is used in the paint. While timber may give you a more natural look and feel to your home, uPVC is easier to make and maintain. The real choice in deciding on whether you want to use wooden or fiberglass is in the look and feel that you want from your windows. If you like the all-natural look, then go with timber, but the fact that you don’t have to maintain the vinyl windows as much as the timber makes you smile, then that should be your choice. The decision you make will be the right one for your home and you shouldn’t have to second guess yourself. When investing in a property, often many choose to focus on the physical look and undoubtedly the energy saving benefits of double glazed windows. There is also the cost effectiveness and the added value to your home. The one thing that often gets overlooked however is just how great they are for security. Depending on the type of windows you are seeking, these can be great as a security deterrent as well as actual security benefit. 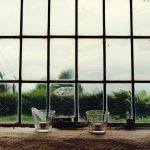 We look at some of the types of windows and the features that may stop a burglary in its tracks. Often when your home gets warm (especially in the summer) you may want to leave your windows open whilst your out. The problem being that an open window is seen as an opening for a burglar to seize an opportunity at a moments notice, and help themselves to your possessions. If you do not leave the windows open your home will become unbearably hot in the summer months. 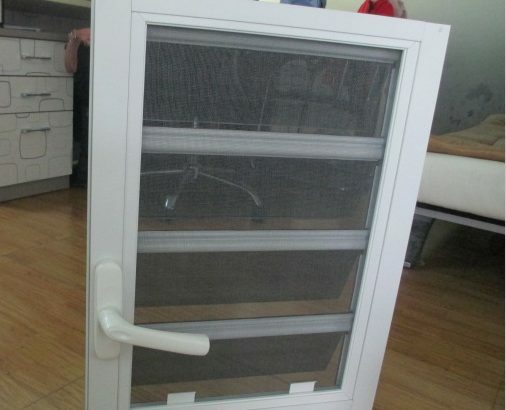 This is where secure locking windows come in, these have a mechanism where they can be left open ever so slightly to let the air from outside in but have an extra locking section which will prevent the window being opened further by hand. In most situations the windows will appear closed or at least locked since there will be a little space seen when viewed up close. Even if a thief wanted to try their luck it would mean the use of a crowbar and damage to your property, something that may be deemed to high risk to try it. Privacy Blinds also help make burglars think twice. Having the right type of window could make a huge difference to the outcome of a burglary. Casement windows might showcase a lot of your things whereas fire escape windows may look a bit daunting to a potential thief. One great benefit of the newer modeled reversible windows available from window and conservatory suppliers Harvey’s Windows is that a thief would be unlikely to take their chances against the odd shaped glass and frame that it comes with. Choosing your window type is important when rehabbing your property as it could make a difference to your home insurance. 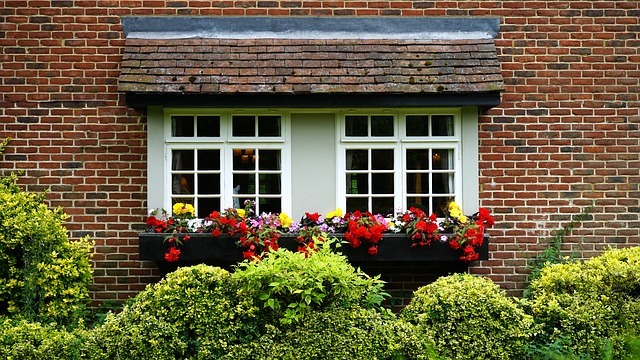 A consideration for a new home owner when placing windows should also be what a potential thief may see through them and take their chances for. High quality glass replacement will also make your property impenetrable since they will not be able to break it as they would the standard glass. Double or even triple glazing will not just make your home warm and cost saving but also prevent a potential burglary. One of the most important aspects of your home is the windows. These glorious spaces of viewing pleasure are one of the most expensive wastes of money when it comes to heating and cooling. Years ago, you could only purchase single pane glass for your home. You can always search on Google for window repair companies or check out Google+ for Glass Companies. The heating and cooling bills would almost cause you to have to file bankruptcy. These days, however, there are double and triple pane windows built specifically to ease your utilities bill by offering superb weathering. 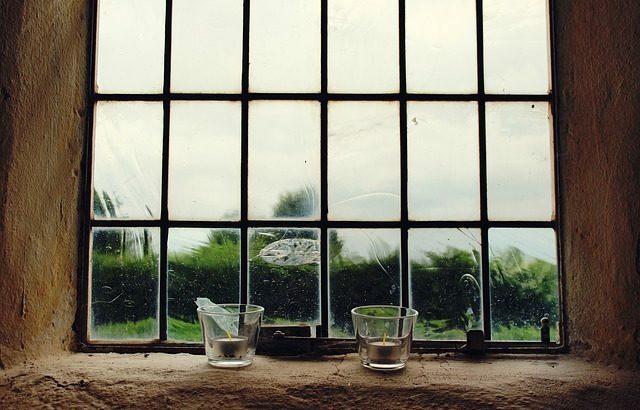 When it comes to windows that will hold up to the weather, the most important aspect is the glazing. There are two values to be aware of when it comes to window glazing; the R and U values. The R value determines the insulating properties of the window, and the U value determines how well it transmits heat. Therefore, the higher the R value is and the lower the U value is the better your windows will be for you and your home. This is very important when it comes to choosing the right windows. When it comes to the frames your new windows will be sitting in, there are a couple of things you need to think about. If you’re at being environmentally friendly and want to go the “Green” route, you’ll probably want to go with the uPVC frames. While they aren’t exactly made from recycled materials, they’ll last longer than timber frames, and you won’t be cutting down any trees just to hold your windows up. They have really pulled out all the stops when it comes to making these types of frames, and it won’t be too long before they can be made from recycled plastics and aluminum. The only real issue is that they’re really hard to repaint if you ever decide to change the color of the outside of your house. Whatever way you decide to go, you can find all the information you‘ll need online regarding how to find the perfect match of windows and frames for your needs. 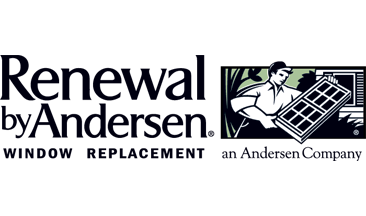 You can also check out the manufacturer’s website for information regarding any questions you might have about the product in question. Just make sure you don’t fall for the first ones you find. There are many choices that you can make, and having the best price for the best type of window is the key in making the right decision. Should you go with Window Coverings or Blinds? When you decide to change out your existing window coverings, there are many choices that you have in order to get the feel that is unique to you and your home. Some people choose to go with curtains all through their homes, and others choose to go with a more modern aspect of window blinds. But, there are some people that have decided to go both routes and choose to have curtain blinds installed. 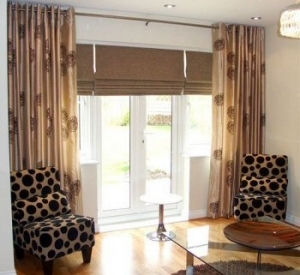 These are a combination of both curtains and blinds, and add a bit or airy amusement to any room they are in. Not only can you have them made in specifications to the design of your room, but you can also choose what kinds of materials they are made of so it makes it easier on you, the designer, to match your curtain blinds with other furniture aspects in your rooms. This gives you a great amount of customization that other options fail to give. Not only are you given the best of both worlds when it comes to window treatments and coverings, but they are sharply reduced in price compared to their singular components. This is a great option for people that may not have enough money to do their entire home in either blinds or curtains. Now, you can combine these two options into one low price aspect that looks great and saves on your wallet. But you should be aware; you buy what you pay for, and if you pay a substandard price for these coverings, chances are you will end up with a substandard curtain blind that won’t last very long. If you feel that you are falling into the trap of substandard material, you should take the time to do some research to see what other people have thought about the same product. There are quite a few blogs online that give opinions of all kinds of different products, and you are sure to be able to find some on the curtain blinds you have in mind. You can also keep an eye on the ratings and comments from the places that you are thinking of purchasing these coverings from to get an idea of what other people have thought about their purchase of these products. Many forget about decor for bathrooms. Not only do window treatments give a bathroom more appeal, it also helps customize it and give it that spa feeling we all want. You can match the curtain blinds or coverings with the vanity and the shower curtain.